Designed to give you complete traceability over who worked on each job and when. Critical to improving quality, targeting training, and reacting to product recalls and complaints. Staff will love the simple recording process and will never want to return to manual job tracking again. Amazing recognition rates using state-of-the-art facial recognition and continuous learning. The sub-second recognition process works at a glance, streamlining the process of recording attendance. Operates even with intermittent connectivity. Simple pay per user model designed to suit organisations of all shapes and sizes. Unlike finger print readers, works reliably when workers have dirty, greasy, and sweaty fingers. It even works when your Internet connection is down, buffering up events until a connection is restored. The sub-second recognition process works at a glance, allowing staff to focus on the job at hand. 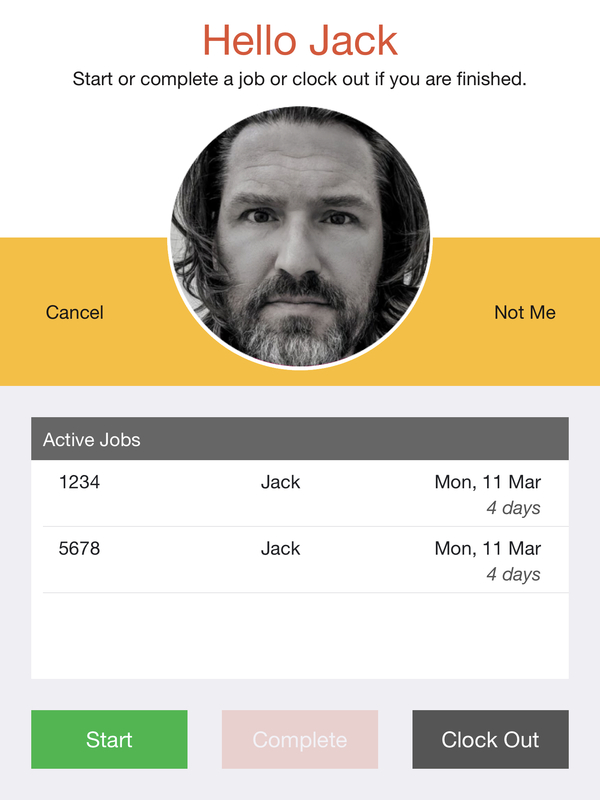 Our Job Tracking solution is designed for manufacturing and customer service environments where there is a need to track who worked on each job and when. NoahFace runs on a tablet permanently mounted at each workstation or service counter. Whenever staff start or complete their work on a a job, they simply present themselves to NoahFace which will automatically recognise them. They then enter the job number (or scan a barcode) to record their action - it's that easy! The system can operate either completely stand-alone or integrated with an existing Work in Progress (WIP) system. Either way, a job summary report can be viewed or exported at any time from a Web browser. You can then drill down to view clipped photos of each individual event, providing you complete traceability of the work history of each job.